For all of the years I practiced medicine as a surgeon in El Dorado, Arkansas I had to take ER call at least once every 3 or 4 days. There was an approximate 10 year period when I first began practice in 1971 there was not a full-time ER physician hired by the 2 local hospitals to cover emergency cases. His responsibilities would include all emergency medical problems and minor surgical procedures such as laceration repair and drainage of uncomplicated abscesses Larger hospitals in the state such as Baptist Medical Center, St. Vincent’s and University Medical Center in Little Rock were some the first hospitals in Arkansas to hire physicians to work in the emergency room and Emergency Medicine soon became a medical sub-specialty. The early method for ER coverage was relatively simple. Every physician on the hospital staff was on a rotation schedule and was responsible for treating every emergency room patient who presented to the ER for a 24 hour period. Most of the emergencies could be handled by telephone while other more serious conditions required the doctor going to the ER to examine and treat the patient. Some physicians were more diligent and precise in treating patients and spent more time in face to face encounters. Newer physicians in town were placed on the schedule following the less diligent since the rule was if the on-call physician refused or was unable to treat a patient, the ER nurse had the authority to contact the next physician on the list. It was not an ideal system but most of the time it worked. An older primary care physician whom I’ll identify as “Dr. C” was always on the schedule immediately ahead of me. He had the propensity for having a few drinks of beverage alcohol following his work schedule each day and occasionally would have a few too many drinks which affected his medical judgement. The ER nurse could immediately discern his sobriety and if necessary would call me to resolve the appropriate treatment for the patient. I didn’t like having to cover an additional night on-call but understood the reasoning. In the early hours of a Sunday morning I received a phone call from Mrs. Montgomery, the chief ER nurse at Warner Brown Hospital. In her quiet, sweet voice which was immediately recognizable she said, “Dr. Moore I have a 21-year-old Black-American man who is inebriated and got into a fight this evening. He has multiple lacerations which need sutures.” I said, “Mrs. Montgomery, I’m not the one to treat him. Dr. C. is on call.” She said, “I called him and he told me to just flush him down the commode.” Teasing her a little I said, “Have you done that?”, to which she responded, “Dr. Moore, he’s too big!” I knew the problem with Dr. C that evening so I told her I would come to the ER and treat the individual. As I finished the work on the patient I jokingly told Mrs. Montgomery I agreed with her assessment of the patient regarding the commode! In another encounter years later at Union Medical Center (now The Medical Center of South Arkansas), I was walking through the Emergency Room on the way to see a post-operative patient on the 3rd floor when I was stopped by one of the ER nurses. 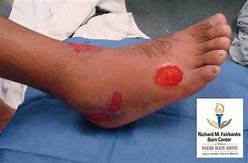 She said, “I know you are not on call, but I have a young man in Room 1 who has a 2nd degree grease burn of his right foot. He works for Church’s Chicken and some grease was accidentally spilled on his foot. May I give him a tetanus shot?” I walked into Room 1 to briefly inspect the wound which was not infected, and I ordered her to give the tetanus booster. She said, “Where do you want me to give it?”, knowing she was asking should she give it in the arm or in the buttocks. Without thinking I quickly said, “Just give it to him in that foot.” Immediately the young man jumped off the gurney and bolted through the door and out of the ER into the parking lot. He ran into an adjacent neighborhood with no bandage nor a shoe on his burned right foot. It all happened so suddenly, and I was laughing so hard it took a few minutes for us to alert a security guard to run after the fleeing patient! When he was finally brought back to the ER the runaway said, “I wasn’t going to let that nurse give me a shot in my sore foot.” We reassured him he would not be given a tetanus shot in his foot, and he was given the appropriate treatment for his injury. The uncertainty of the injuries and the identity of the injured patients caused me some anxiety during all those years of taking emergency calls. When I was called to treat someone with a life-threatening injury I was always concerned it might be a family member or someone whom I knew well. As I grew older and had experienced some very emotionally draining emergency room encounters, I welcomed the day when I was no longer required to take ER call. To this day when I hear the sound of an ambulance or see the flashing lights, it causes me to cringe a bit thinking the next ring of the telephone might be a call for me to come to the ER. I have a feeling you docs with ER experience could write a really entertaining book! The flushing comment was classic though the EPA would strongly frown on such a violation. I have no idea the identity of the “impaired” doctor you mentioned (and wouldn’t ask you to divulge) but I remember when we moved to El Do in ’66, Mother told us about a certain doctor who lived a few doors down from your house on Madison. Mother pointed out his blue Buick and told us in no uncertain terms, “If you see this car coming down Madison, get up in a yard. Not even the sidewalk is safe!” I also heard he was known to show up in the ER in house slippers and possibly a robe. As for his notoriously bad driving, I don’t know if it was related to the inebriation or just being a wild man. There were several older doctors on staff when I began practice who were quite “colorful” to say the least. The doctor you mentioned was one of the most colorful and he was a next-door neighbor. I will write a blog post about him and mention his name because everyone knew some of his unusual attributes. He did not have an alcohol problem at all. He was just “unusual”. Hope you and Lori are doing well. Cathy and I are in El Dorado this weekend for the wedding of Drew our oldest grandson. Fun time! Wonderful! Glad y’all are back for a visit. I know you’ll enjoy cruising downtown to see all the wonderful improvements. Lori is better, able to go to church, even on Wednesdays. She’s even been able to teach a couple of times.